Do you think that Kairi may possibly remember Aqua? But with Kairi, when Aqua put a magic spell on her necklace, she still wears it in all KH games, and mysteriously has the same hairstyle..
Also Kairi doesn't really remember anything from when she lived in Radiant Garden. If she could barely remember her own grandma or the world she came from, it is highly unlikely she'll remember some random lady she met in the past. She probably wears the necklace because it was the only thing that she had on her as a child that tied her to her past. Riku remembers Terra which is shown in KH3D. Wasn't it implied that she was lying about not remembering anything about Radiant Garden/Hollow Bastion? Anyways, when I was fifteen, I certainly didn't remember anyone I met just once as a four-year-old. But hey, it's Kingdom Hearts, memory is a wonky thing. Sora's never really had the opportunity to actually meet Ventus. The first time was when Sora's newborn heart came into contact with Ventus' (and I highly doubt that anyone remembers the moments just after they're born, even with KH memory weirdness), and the second time was when he was a four-year-old, talking to a pretty sparkling sphere that told him only three things: I'm dying, you saved me some time ago without knowing it, and I need to rest. ... It's kinda odd that Sora doesn't even know the name of the guy who's heart has been stuck inside of him for more than half his life, now that I think about it. Riku definitely remembers Terra, though. He even comments on how Ansem SoD's appearance reminds him of Terra, which could even explain why Riku went along with Ansem's ideas so easily way back in KH1. She was 4...went through who knows what kind of trauma being sent out to the sea of worlds and then 10 years of memories of being on DI. It would have to have been vague. If she could barely remember her own grandma or the world she came from, it is highly unlikely she'll remember some random lady she met in the past. Who did Kairi even live with on Destiny Islands? Are the islands like the one from Lord of the Flies, totally governed by children? Please Nomura. We need the answers. You know...when I look at you...there's this memory that flashes back. A secret I said I'd keep when I was little. The main reason I kept dreaming about seeing the outside world...was 'cause of him. So Riku remembered Terra mostly because of his dream of the outside world, but Ansem jogged his memory of the moment they met and the promise they kept. Kairi probably doesn't actually have amnesia, but like Ethy said, and like Kairi herself admitted, she doesn't remember much about Hollow Bastion now and considers Destiny Islands her true home. We still don't know exactly how much she remembers, but if we considered being changed by unversed and saved by a woman who weilded a giant key and Kairi felt compelled to grab onto and just stare at for a few seconds, then it's possible that Kairi's memory of Aqua can be jogged by something. I doubt she actively remembers Aqua, but I think she might see something that makes that memory flash back, so to speak. The islands Sora and the gang are playing is only a one part of the whole thing. That place is probably for kids to play around, and were everybody really lives is the main island which we see in KHII. When Kairi got to DI, she was sent to the mayors house. Don`t know if she lived there thou. And as hearing Sora`s mom in KHI, and I think they mention his dad in BBS, there are grown ups living there. School system and everything. But it looks so pretty and big. 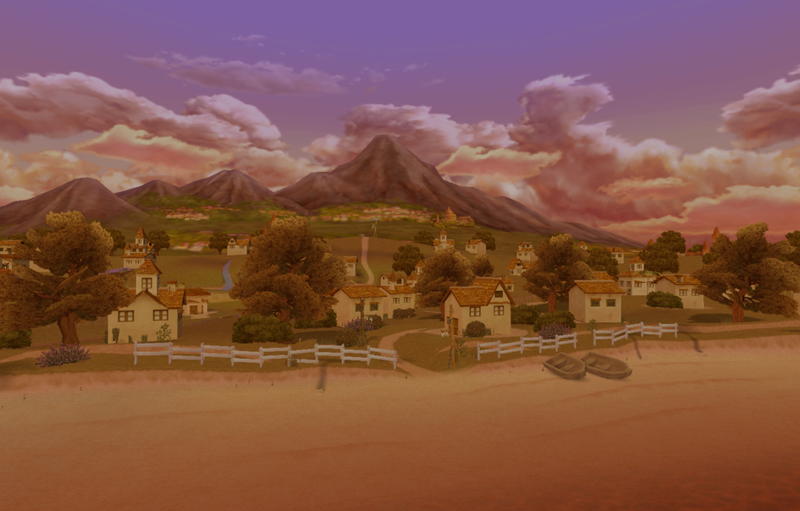 Not a city, by any means --the way everything is spread out suggest it's more country --but I think it's more that plot has kept up from actively exploring the main islands rather than it being dull and boring. How easy life must have been living on that island...the wifi probably sucked though ;P That's the real reason everyone wants to get out of there. As for Kairi remembering Aqua, it'll probably be due to hearts being connected and other touchy feely Kingdom Hearts logic. It's just quaint and cozy. Like living in a rural town out of the big cities and suburban places. Kairi lives with the mayor of Destiny Islands. She may be important to us, but Kairi met her once as a young child. Although it wasn't an everyday kind of meeting, it certainly wouldn't be remembered so easily without something triggering the memory. As children around 3-4, memories are usually kept vivid generally by other people remembering and talking about it (I.e. Your family, friends) or by having strong emotions tied to it. Even those memories will be super fuzzy and fragmented when you get older because the synapses that lead to those memories were young and have been replaced by newer memories, may be dead connections, or just have fewer connections leading to them in the brain. Of course, real world logic doesn't apply to video games but my point is that Kairi has lived a lifetime since she met Aqua that one time. It won't be something she'll remember instantly if she remembered at all. Gotta remember she forgot that she used to even be a resident of Radiant Garden, as much as you think she'd remember the person who saved her life when she was young , I don't think she does, maybe she might seem familiar when/if they meet in KH3 but who knows? You think Aqua might even recognize or remember Kairi? Whether she completely forgot being a resident of Radiant Garden or not is up for debate, but since Aqua seems to remember the name Sora, she'll probably remember Kairi and Riku as well. It should also be remembered that Aqua's perception of time, being in the RoD and all, is a bit different from SRK. To Aqua, meeting SRK was likely not that long ago. That's right actually, I forgot about the interview with Nomura on that hmm. Most likely she'll probably remember Kairi then. I wonder just how much time has passed for her then. Yeah, me too. To Aqua, it'll probably be just like she's been traveling for at most like a month or something, haha. Also how does she eat there? e.e But that's beside the point (lol). When Kairi got to DI, she was sent to the mayors house. Don`t know if she lived there thou. Yes, she does live with him. It was stated in a KH game, I don't remember which, lol.